harriet@oliverstravels.comSituated on the doorstep of vibrant Kalkan town on Turkey's Turquoise coast is four-bedroomed Villa Gumus. on the doorstep of vibrant Kalkan town on Turkey's Turquoise coast is four-bedroomed Villa Gumus. 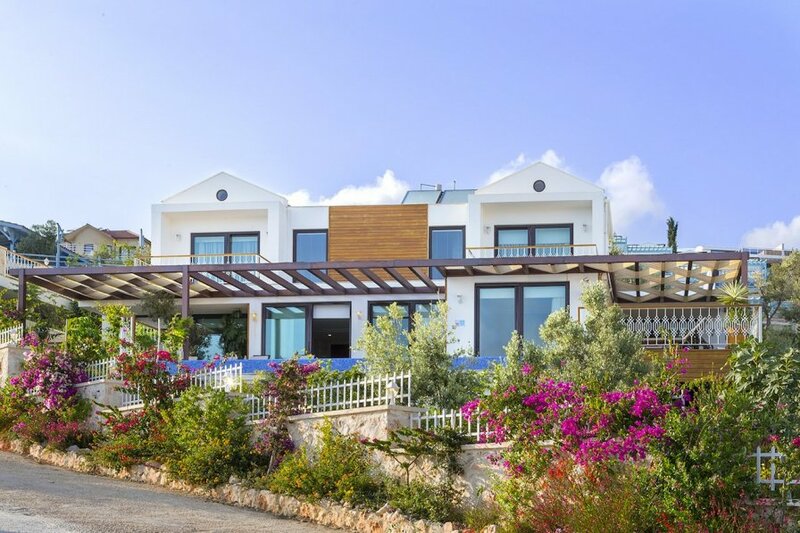 It's a fabulous villa where green pine surroundings meet the rich blue hues of the sea and sky – it's all about rest and relaxation at this modern retreat. The modern architecture perfectly complements the stunning sea views with floor-to-ceiling windows letting the outdoors in, while the large outdoor pool is perfect for slipping into after a day of soaking up the country's natural beauty. With an open-plan fully-equipped kitchen, dining and living room with comfortable sofas and a large television, the villa might feel more like a family home than a holiday retreat. But with luxurious extras like a Jacuzzi tub in the master bedroom, an outdoor infinity swimming pool and a beautiful garden, it has everything you'd expect from a holiday villa (and more). Outside, wood and stone elegantly combine to create a beautiful space that's dotted with pretty flowers and greenery. Comfortably sleeping up to eight guests across its two floors, this villa is the perfect choice for a family-friendly holiday. There are two bedrooms on the ground floor both with en-suite bathrooms and direct swimming pool access. The first floor has two more decadent bedrooms with sea-view balconies and en-suite bathrooms (don't forget that spa-like Jacuzzi in the master bedroom). There's also a table tennis table outside, al fresco dining table and plenty of seats in the sun or the shade. Villa Gumus is in an excellent location – quiet and peaceful, yet within an easy 20-minute walk of Kalkan's centre, beach and picturesque harbour – making it ideal for both relaxing or exploring. Stroll along the cobbled streets browsing painted bowls and silver jewellery, laze on the soft sandy beaches or dine at a roof-top restaurant, offering magnificent views of the bay and mountains. In Kalkan, a small harbourside town on Turkey's southern Turquoise coast, life moves at an elegant pace. Set against a breath-taking mountain backdrop, the old fishing village, turned popular holiday destination, still retains its old-world charm. The vibrant resort has a treasure trove of narrow streets, whitewashed Ottoman Greek houses and inviting boutiques for you to explore. It's also famous for its harbourside bars and rooftop restaurants serving a variety of delicious cuisine. Kalkan remains relatively unspoilt with its beautiful natural scenery of green pine forests, deep blue seas and a beautiful bay on which it sits. Perhaps the main stand-out feature is the harbour lined with colourful cafes and restaurants and dotted traditional fishing boats. You can take a boat tour on a classic wooden gullet (Turkish boat) and explore the beauty of the bay. With its closeness to the pine-tree-clad Taurus mountains too, there are plenty of exciting walking and mountain biking routes. You could also book a horse riding tour to traverse the mountains and olive vineyards, even ride on Patara Beach. In the town centre, you'll find shops selling everything from patterned rugs (Kilims) to chic souvenirs. The local market is well worth a visit too to ignite your senses and have a go at haggling. Look out for stalls serving fresh gozleme – traditional and tasty thin dough savoury crepes. By night, head to one of the roof-top bars or restaurants for stunning views of the town with your evening meal. It wouldn't be a fantastic holiday without a trip to the beach, right? For a soft sandy spots head to the 12km-long Patara Beach which is also a National Park or the much photgraphed Kaputas. Both are a short drive awayor Kalkan has many day beach clubs – complete with paved platform terraces and restaurant facilities and opportunities to take part in water sports like jet ski and waterskiing. Whether you want to swim, snorkel or just watch the world go by, it's the ideal day out. For exploring further afield, you could drive 30 minutes to the bohemian town of Kas, stopping off to explore the beautiful surrounding villages on the way. In Kas, there are more top-notch restaurants and shops, alongside the impressive ancient site of Antiphellos. From Kas, you could book a boat trip to Kekova island where you can swim or snorkel around the part-sunken ruins of Dolchiste, an ancient 2nd-century town which was destroyed by an earthquake.